The Contemporary Ensemble at SFA will perform the music of the Temptations; Earth, Wind & Fire; Stevie Wonder and other R&B favorites when the student ensemble performs at 7:30 p.m. Saturday, Dec. 1, in the Music Recital Hall on the SFA campus. 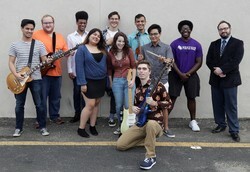 NACOGDOCHES, Texas - The Contemporary Ensemble at Stephen F. Austin State University will perform a rhythm and blues concert at 7:30 p.m. Saturday, Dec. 1, in the Music Recital Hall on the SFA campus. The program will feature R&B music from multiple decades starting with the 1960s, according to Nick Lambson, instructor in the Sound Recording Technology program in the SFA School of Music. "A lot of music in this genre has a large instrumentation, so in addition to vocals, guitars, bass and drums, we have keys, violin, trumpet and trombones," Lambson said. Among the selection highlights are "My Girl" by the Temptations; "September" by Earth, Wind & Fire; "Higher Ground" by Stevie Wonder; "Smooth Operator" by Sade; "He Wasn't Man Enough" by Toni Braxton; and "Good Man" by Raphael Saadiq. Lambson did the transcription arrangement for "Good Man," and SFA student Travis Wattingly provided the arrangement for the Braxton piece.